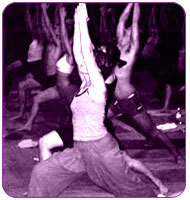 ﻿﻿About the yoga:﻿﻿ Ashtanga is a dynamic yoga practice. Those who already have some knowledge of yoga will find many familiarities in this 'Mysore style' practice where the main difference is the focus on developing a self practice within a group situation. The method taught is based on the fundamentals of the Ashtanga yoga counted method but often I also draw upon whatever additional teachings maybe helpful for the individual practicing. Recognising the value in self development and changing nature of individual progression. Experiment and research around the method can be helpful in encouraging understanding and overcoming obstacles. About the teacher: Brigid is an experienced teacher and student of John and Lucy Scott for many years. Wednesday early morning and Friday evenings are at The Shambhala Buddhist Centre - Lower Redland road Bristol. Brigid is an experienced teacher and student of John and Lucy Scott for many years. Please contact me to discuss your particular needs and to find out about private tuition.